If you’re a skin care fanatic, you’re probably familiar with LED light therapy — depending on the color, LED lights can help brighten your complexion, boost your collagen production, or kill bacteria in your skin. A LED light therapy at an aesthetics clinic doesn’t come cheap, thanks to at-home LED therapy devices like Skin Inc’s Optimizer Voyage Tri-Light++, you can now DIY a mini-facial at home for only a fraction of the price. Here is your chance to score a Skin Inc’s Optimizer Voyage Tri-Light++ in Rose Gold at a discounted price of USD $175 (Usual price: USD $277) from Nordstrom Anniversary Sale! 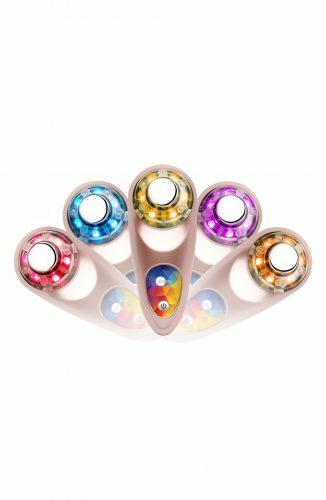 The device features red, yellow, blue, orange, and purple light, and it comes with two hydrogel masks that can be worn on your face while you use your Tri-Light. Check out other amazing deals on Nordstrom Anniversary Sale. Standard shipping on all US orders are free, so sign up with us to enjoy that!